As much as I love Jessica Alba, I always felt the old Fantastic Four movie lacked something. For a good portion of the movies, I really expected the two who were supposed to be brother and sister to start making out at any time, which kind of ruined any enjoyment I had for the film. I am quite intrigued about the new reboot of the story, which looks like it will be darker and grittier, which I typically like in my superhero movies. One big change I noticed was how much more thing-like the Thing is. He really does look like a big pile of rocks. Honestly, he definitely got the short end of the stick in the mutation department. 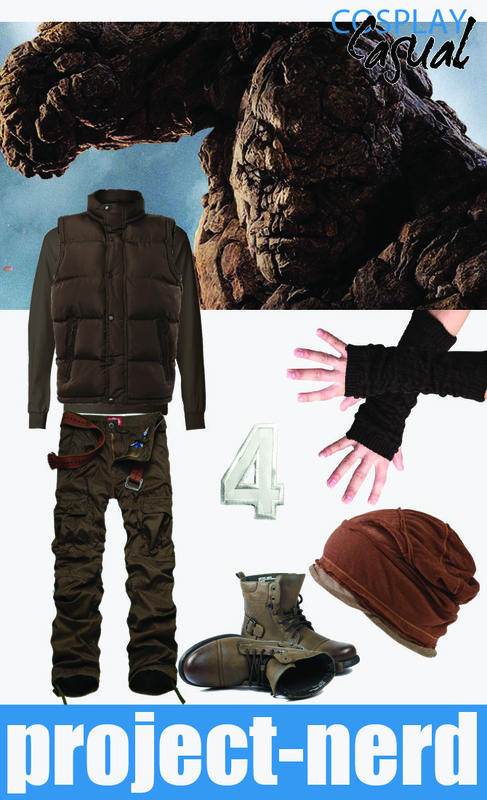 The Thing is the perfect choice for this edition of Cosplay Casual, because few people have time or money to make a life-like costume, but that doesn’t mean you can’t dress up like the most fantastic of the Fantastic 4 using items readily available at any store (my go-to shop for casual cosplay is Amazon. You can find anything there). Of note, this rendition of the Thing is mainly brown, as opposed to the largely orange color of the previous movies and in the comics. He also looks grumpy all the time, so to complete the look, you should also adopt a grim expression or growl at people who greet you before you’ve had your coffee. For men or women, girls or boys, the elements of the costume are simple. 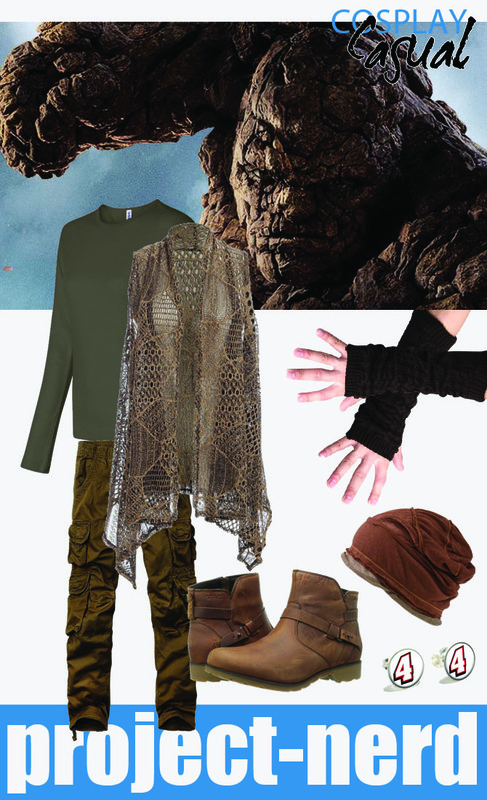 Go for brownish, lumpy textures with a lot of layers. Since you don’t have rocky feet, add some tough boots. Add or subtract layers as weather dictates. Clearly, the Thing is grumpy all the time because he is always HOT under all that rockiness. Use a number 4 emblem to solidify who you are to all the world. I particularly like these number 4 earrings I found. Remember, Halloween is just around the corner, so start thinking now about what you want to be! This Thing costume would be perfect for a costume you can wear to work or go trick or treating in without being too bulky to carry candy around. Who is your favorite Fantastic Four characters? And how would you dress like them?